San Diego de Alcala, a photo by Southworth Sailor on Flickr. Today we started the California missions tour. There are 21 Spanish missions, all about a day's horse ride away from each other stretched along the coast from San Diego to Sonoma. Since our van goes at least three times as fast as a horse, we got to three missions today. We started in San Diego de Alcala with the 'mother mission' and it's visionary Father Serra. 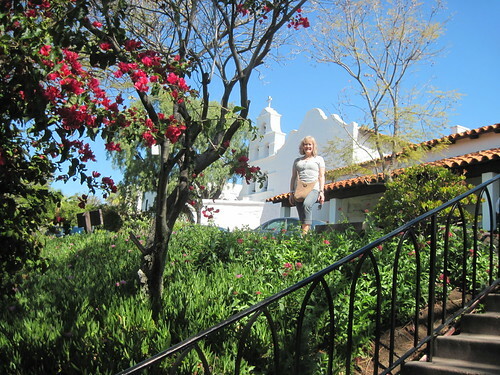 We next visited San Luis Rey in Oceanside and San Juan Capistrano. The weather was great as we strolled through each enjoying the grounds and gardens in the bright sun light. We also found time to enjoy a little of the beach at Laguna Beach. We are in a motel in Costa Mesa tonight, resting up for a new adventure tomorrow.